Moo Dang, literally means 'red pork'. Because the pork you see hanging in restaurants is always obscenely red, for a long time I thought that you had to add red food coloring to make the barbequed pork. Well, I found out that you don't have to. The pork will turn red when cooked, just not the fire engine red seen in restaurants. In Thailand, Moo Dang is traditionally made by boiling pork in the marinade, but I have an aversion to boiling foods because of the loss of flavor and nutrients. That may be why you see a lot of restaurants adding the food coloring. 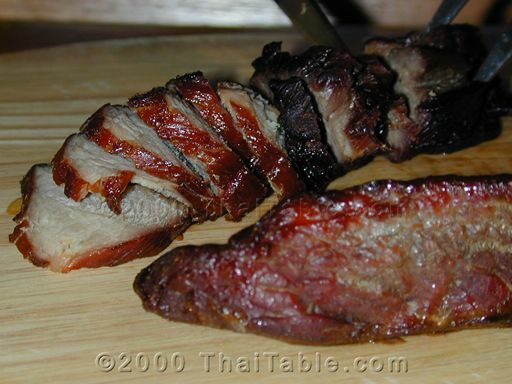 Barbequed pork can be frozen for future use and re-heated in the microwave. Frozen barbequed pork makes future lunches much faster. Select pork that is a big chunk and not a pork chop. If you like pork loin, that is great. But you don't have to get pork loin. 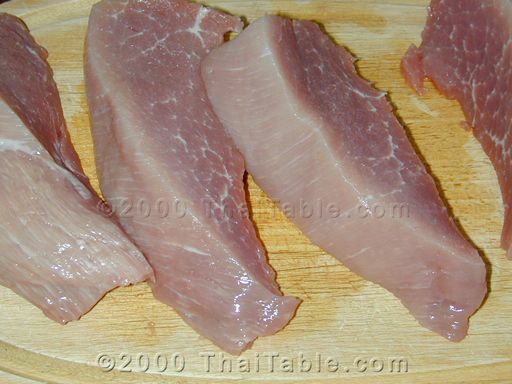 Asian markets normally have the right cut of pork for sale as 4 inch by 5 inch by 3 inch chunks of meat. Cut the pork with the grain into long pieces, 2 inches x 2 inches cross-sectional and any length you like. 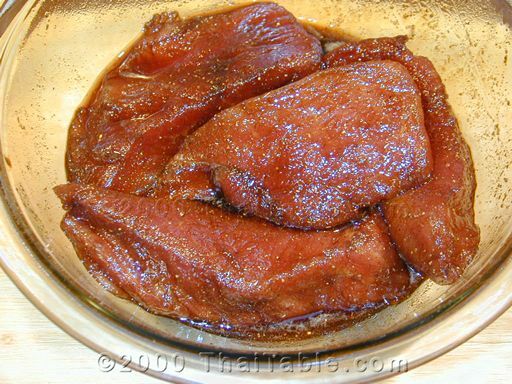 Marinade with the rest of the ingredients for at least half an hour or overnight. Heat the oven to 350 and bake for an hour on a tray, cast iron pan or piece of aluminum foil. 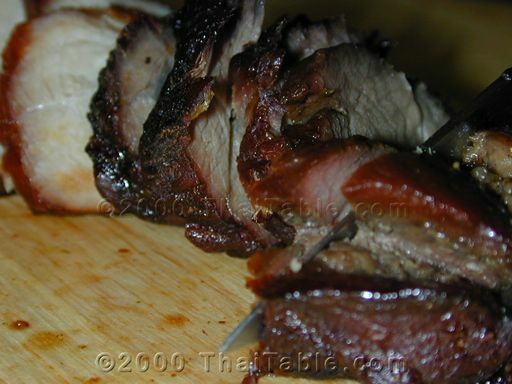 When done, the pork should be reddish, firm and dry but not burned. Of course, you can also cook the pork on the grill, but the oven is convenient and available year-round.